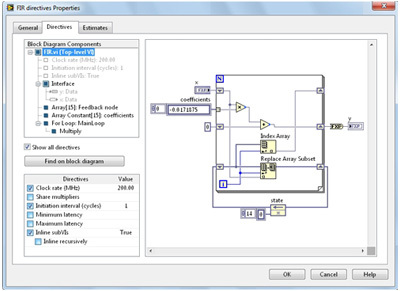 National Instruments has announced the LabVIEW FPGA IP Builder add-on, which uses leading Xilinx VivadoTM High-Level Synthesis technology to simplify high-performance field-programmable gate array (FPGA) algorithm design. This new LabVIEW add-on enhances productivity by reducing the need for manual optimization of high-performance algorithms. Instead, users specify functional behavior along with design constraints and the software automatically generates a hardware implementation to meet requirements. The new add-on tightly integrates with LabVIEW and the LabVIEW DSP Design Module, a LabVIEW module that helps researchers and system designers in the RF and telecommunications space quickly create communication links and multirate digital signal processing (DSP) algorithms on FPGAs.